President Trump just did more to advance blacks than the Congressional Black Caucus has in decades. Since his election, our president set records for bringing jobs back to the U.S. His latest move to hire American, has employers under scrutiny for hiring lower skilled and lower salaried foreigners. In a far-reaching order signed today, our president commissioned the Departments of Homeland Security, Justice, Labor, and State to review the way H-1B visas are awarded, to prevent immigration fraud and abuse. Each department will recommend revisions in the approval process for H-1B visas. 85,000 immigrants per year receive H-1B visas for high-tech jobs that American companies claim cannot be filled by Americans. However, since encouraging companies to hire American workers is a top Trump priority, this number will undoubtedly shrink. Greater scrutiny of H-1B dependent employers, including site visits to determine how hard they try to hire American workers. The requirement that H-1B visa applicants prove they perform complex, specialized jobs. Spouses of some H-1B holders who seek employment in the U.S. may also be a target of scrutiny, based on a recent federal court case. How does Trump’s “Hire American” order help black college students? 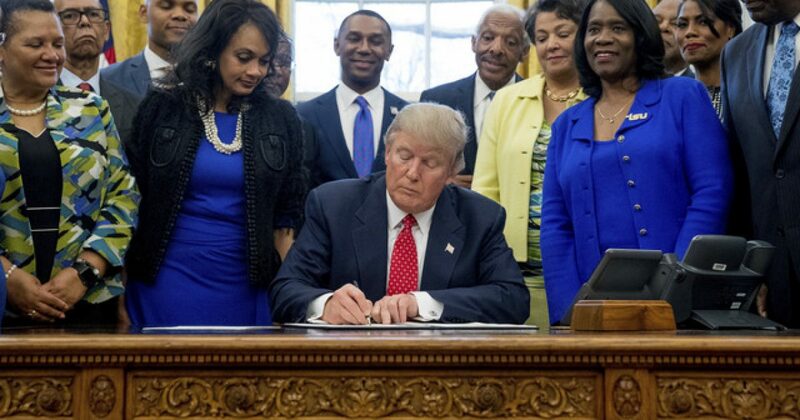 Trump’s previous order prioritized support for historically black colleges and universities (HBCUs) from the Department of Education to the White House. HCBUs include any black college or university established before 1964. These organizations were established with the principal mission of educating African-Americans who were barred from attending majority-white schools in the pre-civil-rights era. Over 100 campuses are designated HBCUs and serve more than 300,000 students. However, these schools have struggled under Democrats. HBCUs have gone from graduating the best students in the past to losing enrollment as much as 20 percent per year. In a recent meeting with the president, Black leaders told the Trump administration that HBCU science, technology, engineering, and math graduates are ready to fill high-tech jobs that now go to foreign workers. HBCU graduates will now get an early look at these opportunities. The hope is this will inspire more blacks to enter the STEM programs in school. HBCUs comprise 3 percent of the nation’s universities but produce 27% of African-American students with bachelor’s degrees in STEM fields. Nevertheless, 2011 census data shows that only 6% of America’s STEM-related workforce is black. By 2018, over 8 million STEM jobs will be available in the United States. American workers should be first in line for these jobs. So, black educators see Trump’s policy as a real opportunity for black students. Thanks to President Trump’s “America First” orders, opportunities will be numerous for all.